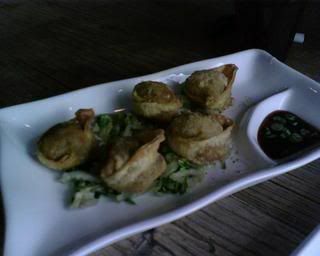 LTHForum.com - UrbanBelly - get your dumpling on! UrbanBelly - get your dumpling on! LTH Home > Chat > Eating Out in Chicagoland > UrbanBelly - get your dumpling on! My friend and I saw that UrbanBelly would be opening today and we dropped everything to head over and get our dumpling on. *NOTE* Please forgive the pictures, we forgot to bring a camera with us! We were expecting some opening day jitters/bumps, but the operation was already running smoothly. The interior is very tiny, but bright, with four communal tables that each seat about 10 people. You order and pay at the counter, receive a number to place on your table and the food is brought out to you. Yvonne came out to chat with us and assured us that all dumplings are made in house - hooray! Bill (former chef de cuisine at Charlie Trotter's) and Yvonne Kim (front of house, Charlie Trotter's/Daniel Boulud) have really hit a home run with UrbanBelly - each dish we had was more delicious than the last. My friend commented that UB was very much like Momofuku and Momofuku Ssam bar in NYC, minus the raw fish and the attitude. Each one was a home run, but the duck was truly exceptional, deep fried and bursting with rich flavor, right down to the incredible warm Napa Cabbage they came nested in. 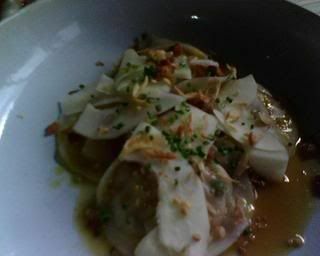 The Chicken dumplings were pan fried, lightly dressed with a dashi broth and garnished with beautiful sauteed shiitakes.The squash dumplings have both a pickled papaya and a bacon garnish, which really adds a nice texture to a very creamy dish. There are two fantastic house made sauces on each table, a balsamic soy and a garlic chile but, really, they are just gilding the lily; these dumplings are perfect as they are. Wanting to sample as much as possible and being a bit on the greedy side, we also ordered the seasonal kimchee (lightly dressed with togarashi and bonito), the Rice Cake with Chicken, Mango and Korean Chile Sauce, and the UrbanBelly Ramen, a feast composed of pork belly, Shiitake, and Pho broth. Bill himself came out to explain that the Rice Cake noodle dish was his Korean play on a favorite chicken dish from his childhood. The chicken could not have been more perfect - light, crisp and juicy. The rice cakes were just chewy enough, the mango a nice counterpoint to the chile and the fish cake was a delicious surprise. Although each dish was impeccable, the Ramen was really a standout for me. The pork belly was utterly perfect, just enough chew to be toothsome with a delicious crisp skin. The greens (mustard?) in the Ramen were a perfect light counterpoint to the richness of the pork, the noodles had just the right amount of chew, and the pho broth was the very, very best I've ever had in Chicago. Savory and not overly sweet, it was the perfect bath for the perfect pork belly. 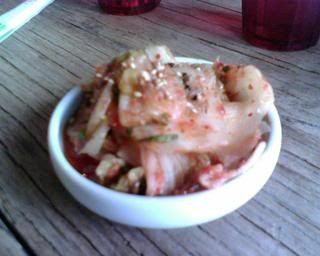 The seasonal kimchee was amazing as well, managing to be light and just pungent enough to remind you that you are eating kimchee at the same time. I'm looking forward to seeing the seasonal rotation. Needless to say, we cleaned our plates, including the ginger candies they brought out at the end of the meal. An unqualified hit and a great addition to the neighborhood, this place is going to be a contender. Prices top out at $13 for the Shrimp Udon and the Scallop Soba, and start at $6 for the Asian Squash dumplings, so it is very reasonably priced as well. I can honestly say that I look forward to eating everything on the menu. Other notes - BYOB, free wi-fi, brunch coming soon, ample parking, carry out available. Due to the size of the dining room, I'd advise calling before going in with a large group to make sure they can accommodate you. Last edited by Ursiform on August 19th, 2008, 7:04 pm, edited 1 time in total. Urban Belly has just moved onto my sooner rather than later list. Thanks for the review and pictures. Thanks for the review. I'm going to see if my sister wants to go here tonight. As soon as I read Duck & Pho Spices Dumpling, I know that my next meal would be at Urban Belly. So today, along with GWiv and Jazzfood, we headed to Urban Belly for lunch with expectations high and our personal urban bellies ready for action. The space itself is quite modest, as you can see below it's hardly more than twice as wide as GWiv, who stopped to take a photo of fellow LTHer Deesher, who was also there with his daughter. I also had a chance to met long time poster Queijo for the first time. The staff of UB couldn't be friendlier. As posted above, the set up is a bit like a fast food joint. You go up to the counter to place your order and pay, then the food is brought to your table randomly as it comes out of the kitchen in true Asian style. The food itself was all very good, with a couple of dishes in particular really standing out for me as something special. We started out with a couple orders of house made dumplings; one order of the Pork & Cilantro pot stickers and one of the Duck & Pho spice dumplings. Surprisingly, I didn't like the duck dumplings as much as I thought I would, and while they were good, I preferred the pork & cilantro dumplings more. The not overdone kick of cilantro was a great counterpoint to the ground pork. I wish they served a steamed version of this dumpling. I'll bet it would be otherworldly. Next up was an order of the Seasonal Kimchee and an order of Chinese Eggplant with Thai Basil. The eggplant, served cold, was one of the best dishes I have eaten this year. Flavors were very well balanced and the eggplant was not mushy in the least. We also ordered three of the rices. All of the rices are made with short grain brown rice, although the dishes are packed with enough flavors that you can easily forget that they use the “healthy kind” of rice. By far my favorite of the three rice dishes that we ordered was the Short Rib & Scallion rice. The rice had a citrus flavor; most likely containing some lemon grass and kaffir lime. The beautifully charred short ribs were great with this rice…so much so that both GWiv and I stopped at Chicago Food Corp to pick up some kalbi to throw on the grill for dinner. The short rib rice along with the eggplant are reason enough for me to return many times. We also ordered Pork Belly & Pineapple Rice and Organic Pea Shoots & Thai Basil Rice. Both of those were good as well, but paled in comparison to the short rib version. Although the rice in all three dishes looked more or less the same, they were each flavored differently, with the pea shoot version being very subtle. To round things out, we tried one of the noodle dishes. We got an order of Rice Cake: Chicken, Mango and Korean Chili Sauce. While the chicken was perfectly fried in the Japanese Katsu style, I quickly got bored with the bland white meat chicken. If this dish was made with chicken thighs instead of breast, I’ll bet it would be excellent. As it was, I probably would have enjoyed the dish more if they simply left the chicken breast out entirely because the accompanying rice noodles, mango and fish cakes in a spicy sauce were quite good and could have stood on their own (in a bigger portion, of course). Urban Belly was a real treat! I plan on being back often for eggplant and short rib rice and to work my way through some of the other menu items…especially in the noodles section. I was also on the list of folks waiting for this place to open. I love asian food of all kinds, with dumplings and noodles of all kinds among my favorites. Needless to say, I headed over for dinner today as soon as I saw this thread open yesterday. First up was the Lamb & Brandy dumplings. The wrapper was the soft, I call it "slurpable" type like a wonton. Filling was flavorful, a bit spicy, and you could definitely taste the brandy. Maybe the filling could have been a bit softer, since the wrapper was soft and the prep was steamed, but overall delicious. Next, I had the Asian Squash dumplings. These ended up being my favorite, which was a little surprising since I'm a bit meat eater. The wrappers were similar to a fresh pasta ravioli, and the filling had that wonderful pureed quality that makes squash so popular for similar uses. Flavor was sweet, but not too sweet, and was accentuated by a combination of fresh apple and orange sprinkled on top of the bowl, while a garlic sauce (with crisped garlic) added a nice savory element. Finally, the Duck & Pho Spices dumplings. These came fried, on top of a bed of spicy cabbage. The filling here was good, but I might not have identified it as duck if I didn't already know. It was spiced really well inside and out though, and the cabbage was awesome. For the main course, I went with the Rice Cake with Chicken, Mango & Korean Chili Sauce. I liked all the elements very much, and even didn't mind the chicken breast meat (although it was a bit bland as stevez mentioned) since there was a great sauce to dip it in. It wasn't cheap (maybe a little over $40 for 2, and my girlfriend is not a hearty eater), but not overpriced either since the quality was good across the board. I'll be back for sure to try other things and introduce my friends to the place. Lancelac wrote: Maybe the filling could have been a bit softer, since the wrapper was soft and the prep was steamed, but overall delicious. Interesting. When I asked Yvonne if they had any steamed dumplings she told me that they only had various fried varieties. Maybe she misunderstood my question. I'm glad to hear about the lamb dumplings. They're on my list for next time. Stevez, I always look forward to your posts--the photos and descriptions are terrific. This place will be getting a drive by tommorow. I drove by after work today to take a look. I already had dinner plans, so couldn't stop to eat, but was impressed with the fact that the chef was dining with a table full of farmers I know from the Green City market. That kind of relationship can only mean good things, in my mind. 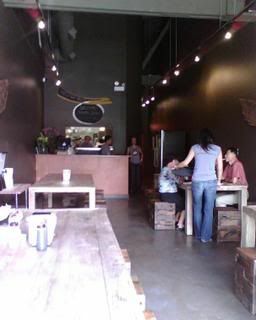 This space is certainly a whole lot nicer than the 4 taquerías I have seen open and close there in the past 2.5 years. Urban Belly turns out also to be the name of a maternity shop in Des Moines. I've now been there three times since they opened (uh, a little obsessive I am in my unemployment) and have ordered the duck dumplings each time - usually along with a few other items. To Steve's point about wanting steamed dumplings, I would like them even better if they weren't fried - the filling is just wonderful, rich, and fragrantly and extravagantly spiced and I've never really been a huge fan of the fried wonton, which they do resemble. I have to concur on the Chicken/Mango/Rice Cake - the chicken is moist but bland, though the sauce is ample enough to lend a bit of additional flavor to the dish. To my taste it was a bit too sweet, so I'll probably stick with the Soba/Oyster mushrooms/Scallops in crab broth the next time around, which has the most perfectly savory, light, and aromatic broth of any soup noodle dish I've had in Chicago. I'm a fan. And wouldn't you know it, this last visit, at lunch, I had the pleasure of meeting - and dining with - GWiv, stevez and Jazzfood. It was my pleasure, gentlemen. I hope we can do it again. While I'm still unemployed. CONNOISSEUR, n. A specialist who knows everything about something and nothing about anything else. Very nice when expectations are exceeded. Not much of that going around these days. While I hadn't heard much about this place, when it was suggested by my food rabbi's that we check it out, I followed in their wake and went along for the ride. The eggplant with extra umami was stellar. Best dish of the day for me and amongst the best of the year. Last dish this good was Pork Belly with Kimchi and Crushed Peanuts in Miami with SteveZ @ Michael's Genuine Food. Next best for me was the Short Rib Rice. The citrus overtones in the rice really put it over the top. This type of flavor balance I can only respect. Skilled comes to mind and something worth "lifting" for the repertoire (imitation being a form of flattery). While I enjoyed most everything outside of the chicken breast itself (the crisped skin/coating was fine, as was the sauce, I just have no place in my heart for white meat in any form) I need to check out more on the noodle side. Next time. As always, a pleasure to meet and eat with some other lth'rs as well. My daughter and I shared the eggplant, wrinkled beans, pork dumplings, lamb dumplings, soba and ramen. The eggplant and the beans were both quite good. We preferred the pork dumplings to the lamb. I guess we were in the mood for something fried. Both the soba and the ramen noodles were very good, although the soba broth did not taste distinctly "crabby" to me. The ramen had three good sized slices of perfect pork belly, which made it a must repeat. Next time (maybe today?) it looks like short rib rice and udon . Lunch yesterday was $55 for the two of us (although we did order a bit more than we needed). I might just order a bit less next time and have dessert at Hot Doug's. I definitely agree that the ramen broth is not crabby - there may be a hint of it somewhere, but the other flavors mask it. 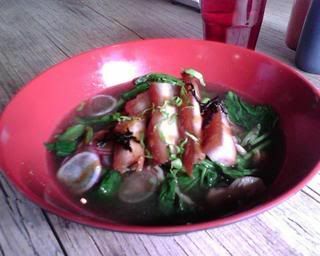 I do love the flavor, however, and find it to be one of the finest Japanese-style fish-based broths in Chicago. Not too sweet, not too strong. Just right. We had the chicken rice cake thing and I got the soba. The rice cake sauce was excellent. 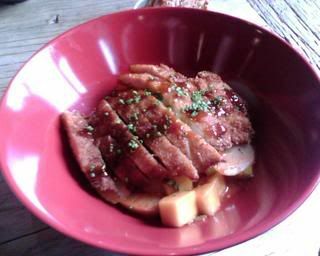 spicy, mango, but the chicken meat itself was chewy and a bit bland...almost like a milanesa. The soba was a bit underseasoned. Just the ingredients in a broth. Here is a scallop. It tastes like a scallop. Here is a mushroom. It tastes like a mushroom. Just a bit boring. The being said, I probably ordered the wrong stuff, next time I'd do dumplings only. It wasn't horrible, just I had better for less. Being cheap I suppose. The rice bowls (the shortrib) are tiny for $8. Palm sized. The guy across from me who got one asked the server what it was. She said the shortrib. He said: "REALLY?" Also I think it's a bad set up. Whenever you have open seating like that you need some crowd control. Seeing people nervously scan for seats while hovering with their pinot grigio was a bit distracting. I know how counter service works and really like it, but this was just a long lane of flesh that people had to negociate twice. For having so many staff flitting around, you might as well have a hostess/waitress manage the seating. Like they do at Milk & Honey or Hot Doug's. I just got back from Urban Belly and I must say it is in the running, for me, for the best new restaurant of the year in Chicago. I had the short ribs and scallion rice which was outrageously good. I think it's the way they cooked the rice, there was a lot of sour salty going on which was a great counterpoint to the flavorful grilling of the shortribs. I also loved the pork and cilantro dumpling, and was wonderfully surprised when I realized that the shortbeans they were lying on had lovely crispy bits of bacon (or was it pork belly). I am going back tomorrow to try some more of the dumplings (they only had asian squash and pork and cilantro at lunch today, since they had a busy night last night and ran out of the others) and another helping of the shortribs rice. I can certainly eat two helpings in one sitting of this! For having so many staff flitting around, you might as well have a hostess/waitress manage the seating. Like they do at Milk & Honey or Hot Doug's. I have never seen this at either Milk & Honey or Hot Doug's. My experience at both those places is that you order your food, sit down if there's available seating, and someone brings your food out to you. Does Urban Belly do something different? I'm going there tonight and I'm curious as to what kind of stress level there might be. I can deal with pretty much anything, but my dining companion for the evening might not be so tolerant. Anthony Bourdain on Barack Obama: "He's from Chicago, so he knows what good food is." lookjerk wrote: Also I think it's a bad set up. Whenever you have open seating like that you need some crowd control. Seeing people nervously scan for seats while hovering with their pinot grigio was a bit distracting. I know how counter service works and really like it, but this was just a long lane of flesh that people had to negociate twice. For having so many staff flitting around, you might as well have a hostess/waitress manage the seating. Like they do at Milk & Honey or Hot Doug's. Ugh . . . this is bad news for me. I really want to try this place but I hate open seating. It is one of the major reasons why I rarely eat at Milk and Honey* (or flew Southwest). I loathe the elbowing and jockeying between customers just to get a seat before your food goes cold. For me, a lot about dining is winding down, and having to worry if you'll get a seat in a timely manner does not wind me down! *Note: I vaguely recall there being some type of organizational seating the last time I was at Milk and Honey. But prior to that, it was a nightmare, and kept me away for a very long time. I ordered my food, received a number on a stand to place at the table and sat down. My order then found me. It was stress free. It was also relatively empty, so if the place was full and there was a line of people waiting to order, it might be a bit more stressful. I would imagine the turnover is also a bit quicker at lunch. 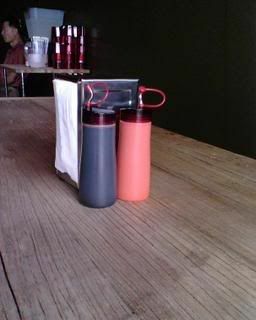 fusionfan wrote: I have never seen this at either Milk & Honey or Hot Doug's. My experience at both those places is that you order your food, sit down if there's available seating, and someone brings your food out to you. I guess what I meant by my Hot Doug/Milk & Honey example is you have to order first before you can sit down, so that people don't "hold" seats, which is what they were doing at U.Belly. Hot Doug's enforces it, I've seen them tell people to get out of the table. Milk & Honey is a bit more passive, when they are busy they have a staff member hold the order numbers and watch for openings. Granted I don't go to either very often for this reason. And the tables just aren't set up right for community seating. Long, close to the wall and with unweidly backless seats. The cranky couple across from us squeezed in along the wall only to discover there were no seats there. I'm really not trying to rag on the place...i want to try it again, especially now that I know what to order. deesher wrote: I ordered my food, received a number on a stand to place at the table and sat down. My order then found me. It was stress free. Yes, absolutely, lunch at UrbanBelly was stress free. Not only stress free, but down right relaxing, enjoyable and delicious. It was a real pleasure meeting you and your daughter Emily. It was also a distinct pleasure to meet Queijo, I've long admired her knowledge of all things cheese. Having one myself I'm a fan of UrbanBelly and am looking forward to a return visit. G Wiv wrote: Yes, absolutely, lunch at UrbanBelly was stress free. Not only stress free, but down right relaxing, enjoyable and delicious. That is good news. I think I'll try it for lunch tomorrow and certainly before the crowds catch on to this place. The food looks absolutely delicious! Do they make their own dumpling wrappers? ChrisH wrote: Do they make their own dumpling wrappers? Yvonne said that they made the dumplings on site, but I didn't ask specifically about the wrappers. Queijo and I are going back for dinner tonight , so I'll see if I can find out. RAB and I are lucky enough to live very close to this wonderful new addition to the neighborhood. We went for dinner tonight and enjoyed ourselves. We walked right in, ordered, and found seats right away. The restaurant was full, but folks after us didn't seem to wait more than a short time for a table. It seemed like nearly half of the diners tonight were either LTHers or folks with LTHers. And, they were there for a good reason - - really tasty food. We enjoyed the squash dumplings, pork dumplings, short ribs rice, eggplant, and pork belly ramen. The squash dumplings were unusual and exceptional, with bacon, orange segments, and papaya slices (thanks to GWiv for setting us straight on the papaya). The pork dumplings were juicy and solid, served with cold green beans seasoned with bacon and fermented black beans. The ramen had a wonderfully rich and flavorful broth, shitake mushrooms, shaved bonito flakes, and soft, chewy pork belly. The cold eggplant was oh-so-good. The fried rice was delicious, with a citrusy, oniony, tang. I'd say the only thing we didn't thoroughly enjoy were the short ribs. The flavor was good, but they were a bit too chewy, and really nothing special. So much so, that I'd rather have more rice and skip the ribs. The hot sauce (sriracha-like) was tangy and surprisingly hot. I used it sparingly - - I enjoyed the hot sauce, but the flavors were so good that I didn't want to mask them. We arrived hungry and left full, but not stuffed. We brought a lovely white wine (2006 Epiphany Inspiration), which was a great pairing for this food. Thanks to RAB for picking a winner. I don't usually drink half a bottle of wine on a school night. Gotta love BYOB. This isn't a cheap Asian hole-in-the-wall. We spent $43 plus tip. While it isn't exactly a bargain, it seems like a decent value considering the quality of the food. The food is well-prepared, tasty, and unique. It's not a place we'll visit weekly; but, given its proximity to our home, we're likely to go back again before too long. Here's a question - - I ordered and paid for our food at the counter before we sat down. The credit card receipt had a tip line. I didn't know how much to tip because I didn't know how much service we would be getting. This restaurant seems unusual for Chicago -- there can't be many restaurants in this price range where you pay at the counter and they deliver your food to you. So, assuming the food and service are good, any thoughts on the appropriate amount to tip? When we asked, they told us that was papaya, not apple! The answer that we got was "no", the wrappers are not made in-house. REB wrote: So, assuming the food and service are good, any thoughts on the appropriate amount to tip? I paid for our order in cash, so didn't see the tip line, but I saw a little tip box near the register. It took me a minute to realize that with the open seating, etc, it might be "not-the-way" to leave a tip on the table after eating, so I went ahead and put about 20% in the box before we were served. It turned out to be well-placed faith, as we were very well taken care of. The place was packed at 7-something last night, but everything was functioning very smoothly, especially considering the short time they've been open. There was a brief wait (10 or 15 min?) before we could order and sit. The place was full of LTHers! I think Gary counted 11 or 12. Just about anything else I could say about the food has been said above, so I'll leave it at "yum." germuska wrote: I paid for our order in cash, so didn't see the tip line, but I saw a little tip box near the register. It took me a minute to realize that with the open seating, etc, it might be "not-the-way" to leave a tip on the table after eating, so I went ahead and put about 20% in the box before we were served. 20%? Really? I had lunch yesterday with a friend at UB and I left about 10%. My friend, a notorious tightwad, basically asked me, "That's it?!" This is why. I went up to the counter to order. I brought my beverage back to my seat. I got the silverware and chopsticks for my friend and I and poured our water. They brought us our food and took away the plates. I'm sorry, but I don't believe that justifies a 20% gratuity. I charged my meal and saw the tip line, as well. I almost always leave a cash tip, so I didn't think anything of it. I did not see the tip box. I left the cash tip on the table since my friend and I were the only ones sitting at it. Even if the place was packed and the joint was jumping, I don't know that I'd reconsider. If that makes me a cheapskate, so be it. As far as the food, my experience was not as splendiferous as the ones posted above. It was good, and I'd go back, but it was nothing transcendent. I'd be happy to expound further, but I'm still kinda sleepy. germuska wrote: There was a brief wait (10 or 15 min?) before we could order and sit. The place was full of LTHers! I think Gary counted 11 or 12. Can I ask when it was that you encountered a wait? (I'm thinking of going there today and will be without car, so I'd like to avoid a wait, if possible.) Gary said that he was there for lunch, and there was no wait. 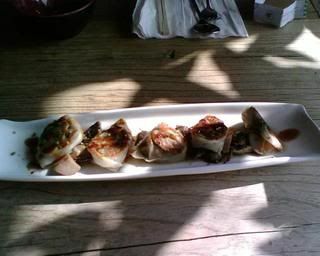 jaybo wrote: As far as the food, my experience was not as splendiferous as the ones posted above. It was good, and I'd go back, but it was nothing transcendent. I'd be happy to expound further, but I'm still kinda sleepy. So, we get two paragraphs about tipping and nothing about your dissenting opinion on the food?